﻿ The Recycling Process at UPM Shotton: Visit Notes. UPM (United Paper Mills) at Shotton principally aims to recycle newspapers, pamphlets and magazines (PAMs) in to huge rolls of high quality paper which it sells to newspaper publishers. Other materials recovered are sent elsewhere for further processing. The type of plant used for sorting is known as a Materials Recovery Facility or MRF, colloquially known as a ‘merf’. UPM have dubbed their plant ‘MRRF’ because it is integrated with the Recycling of paper. UPM Shotton is part of an international group, UPM Biofore, very conscious of its environmental responsibilities. For example, this site generates 77% of its own electricity, using a huge 45.7MW solar farm next door (more than 1 kilometre in length and comprising 180,000 panels). Water is taken from the River Dee, and returned cleaner than it came in. 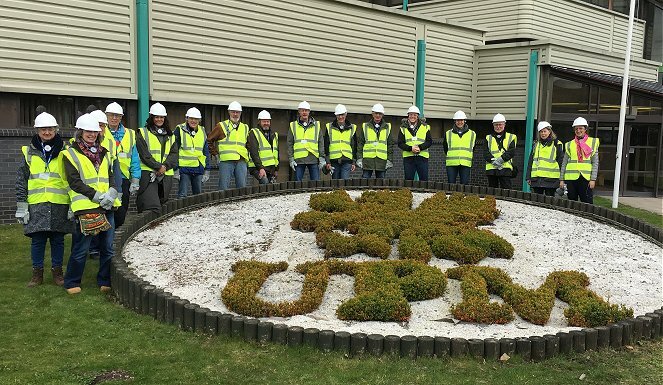 The plant has a design input capacity of about 270,000 tonnes per year, but UPM choose to run it more slowly around 190,000 to get a higher quality of output - to give them a competitive advantage. Cheshire East’s input of about 40,000 tonnes per year is twice as big as UPM’s next largest ‘customer’. Other customers include High Peak, Devon, and Angus in Scotland. 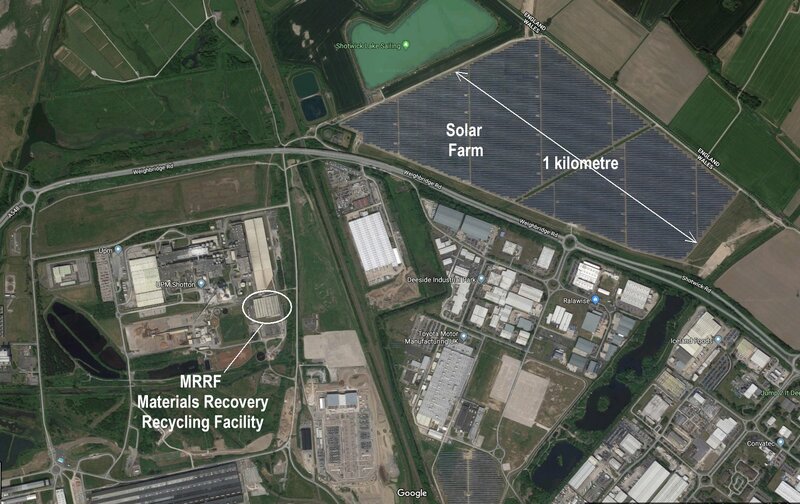 The long distance from some collection points is offset because most of the UPM site’s output is reprocessed locally. Cheshire East pay UPM a ‘gate fee’ per tonne delivered, but it is offset by a share of the value of recyclable materials recovered. So both parties are ecologically and financially motivated to maximise recycling. Wheeled loading shovels are used to mix (homogenise) the incoming material before loading it onto the input conveyor, so that no single separation stage is overloaded. Stiff sheet materials like heavy cardboard ‘surf ‘ over an array of wheels, while smaller items such as glass, plastic bottles and cans, newspapers etc. fall through. Cardboard is not suitable for making into new paper at UPM, so it is baled up and sent to SAICA Natur at Partington in Manchester. Glass among the falling items is smashed and minced into small pieces that are carried away for glass recycling, while the other larger items are carried on to the next stage. The glass stream is filtered to remove small items (bottle tops etc.) at the next off-site process stage - usually at St Helens. The second stage is a another array of wheels with occasional teeth, but this time inclined in two planes. The input is at the bottom left. 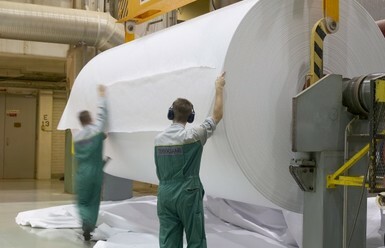 Sheet materials such as paper are lifted to the top left, and are split off to be used on site to make new paper. 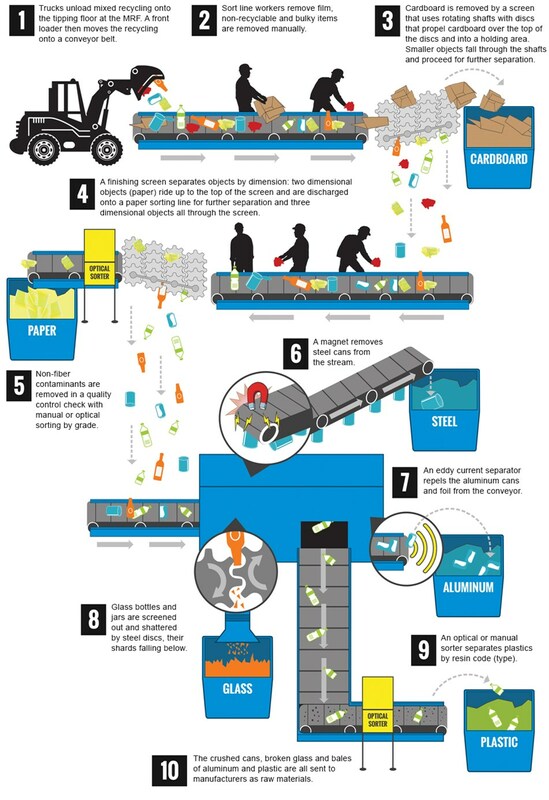 Plastic bottles and cans keep falling back down the slope, but each time they also fall a little to the right, until they ultimately spill off the right side of the array, onto a conveyor. Shredded paper doesn’t behave like other papers, and consequently tends to stay in the ‘residue’, which is ultimately sent to another MRF that recovers the paper using wind separation techniques. The third stage uses a magnetic roller above the moving conveyer to pluck ferrous metals upwards, out of the stream. They are mostly sent to Tata Steel in South Wales. The fourth stage uses an eddy current to repel aluminium cans, making them fly further than other items when the conveyor abruptly turns downwards. Aluminium foil is most easily detected if it is screwed up into a ball. The aluminium separated here is sent to Novelis at Warrington. Plastic bags are sucked off the stream by a precisely controlled updraft when the conveyor abruptly turns downwards. (They fly more readily than paper). The bags often comprise several layers of different polymers, making them impractical to recycle, so they are used for Refuse Derived Fuel. The remaining (mostly) plastic stream is then optically sorted with cameras using near infra-red light (NIR), to separate out PET and HDPE, splitting them from the stream using carefully timed jets of air as the conveyor abruptly turns downwards. Finally, these two plastic materials are sorted by colour, producing four separate recyclates, which are sold on to various converters - mostly In Liverpool and Skelmersdale. The MRRF has the capacity to make one more sorting of plastic, extracting PP tubs and trays, but this is not currently in use - until the market for these grades improves. After each stage people are employed to filter out any misdirection by the machine. No stage is 100% accurate, but the cumulative effect of repeated filtering yields recyclable material of high purity for onward recycling, and UPM regard that quality as their competitive advantage. Where Cheshire East’s advice to residents doesn’t exactly match the practise at UPM, it is because the council aims to send a simple and unchanging message, not subject to fluctuation in the price of recyclates, or technical innovation. The kerbside collectors sing off the same hymn sheet, so don't use the above insight to override the Council’s advice. It could result in your bin being rejected at the kerbside collection stage! The same baling machine is used for all the different materials, but with pressures being automatically adjusted, so materials can be switched between consecutive bales. Class A timber is sold on, mostly for shredding into animal bedding. UPM also have a wood recycling facility that grinds class B and C for making into sheet materials. Class D tantalised timber cannot be reused. Some wood and the waste pulp from the papermaking process are burned for energy recovery. The resulting ash is roughly cost neutral, being now combined with bitumen for road building. There is a good graphic here on the American Advance Disposal website. 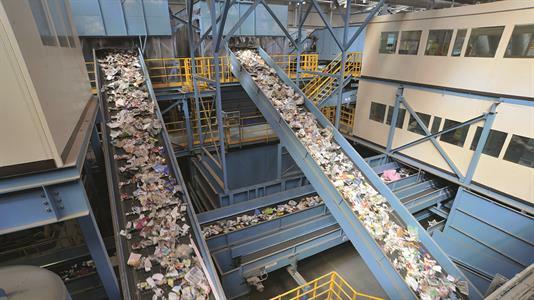 Cheshire East's UPM recycler uses similar separation techniques, in a slightly different order, and goes further - being capable of splitting plastic into six separate grades . The Future: The proposed introduction of a deposit return scheme for bottles and cans in the UK, has raised recycling rates in other countries to 90%. A side effect would be to dilute the recyclable material in the silver bins and upset the current UPM business model.